Bitcoin [BTC], the largest cryptocurrency in the world is making progress with its Lightning Network payments solutions, and is trying to tackle scalability issues while also awaiting Bitcoin ETF approval by the SEC. Now, according to recent reports, the first Bitcoin ATM in the Middle East has been installed in Dubai, the largest and most populated city in the United Arab of Emirates. The people of Dubai and tourists who visit the prime tourist destination will now be able to deposit fiat currency, and receive Bitcoins [BTC] in their digital wallets. 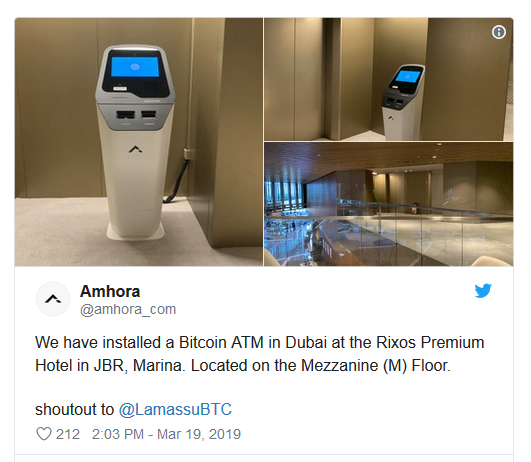 Amhora, a blockchain search engine, announced on Twitter that the organization installed the ATM at Rixos Premium in JBR, Marina, Dubai. The tweet also gave a shout out to the ATM manufacturer, Lamassu, which was responsible for the hardware setup. Anhad Dhingra, CEO of Amhora, emphasized the importance of the installation, and how it could potentially simplify the purchase of Bitcoin for the people of UAE. He mentioned that it was the first Bitcoin ATM in Dubai, and said that the company was looking forward to adding more ATMs in and around the city. Amhora stated that it would receive a 5 percent commission on every purchase made through the crypto ATM. The machine provides a simple solution for tourists who would, in most cases, acquire Bitcoin with their foreign fiat currencies itself, rather than using the local fiat currency, Dirham. The Bitcoin ATM has been programmed to offer only Bitcoin purchases using traditional fiat currency. At press time, the ATM did not have the feature or support for selling cryptocurrencies on the system. However, the company mentioned that it was going to roll out new updates and features soon.